Are you tired of waiting almost every second day for 30mins in the bitter cold until the next Ringbahn is coming? Are you fed up with sick passengers sneezing and coughing into your face on the way to work? Ok, we admit we paint a very dark picture of public transportation in Berlin, but if you prefer to take the bike to work or from A to B why not try out one of the many bike sharing companies in Berlin? 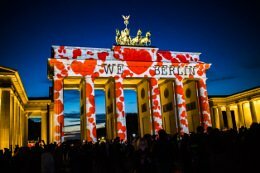 In the beginning of 2018 bikesharing companies were booming all over Berlin. So much that sometimes close to S-Bahn and U-Bahn entrances you would find 50 bikes spilled all over the place. But now after some time the first bikesharing companies already closed down and a few good companies survived the hype. But still with so many companies to choose from it is a tough question how to find the best bike sharing company in Berlin. So let’s have a look at the best ones! And if you want to have all advantages compared in one nice overview check out our table at the bottom of the page. Our favorite bike sharing company right now is Deezer Nextbike. Some of you may have heard of Deezer before as a music streaming platform. And you are right, this is the same company. If you happen to use a paid Deezer account for music streaming you can connect this with your Nextbike app and get 30mins for free on each bike ride. And also there is a cooperation with BVG that also allows you to ride for free for 20mins each bike ride, but you need to return the bike to one of the stations. 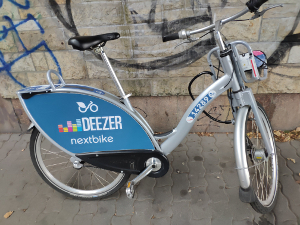 Deezer Nextbikes are great quality and have real tyres filled with air – not like many other cheap Asian bike rental companies that only have airless rubber tyres, which makes cycling very difficult. Also in Berlin you have the so called flex-zones that allow you to leave the bike anywhere inside this zone instead of searching for the next station. Best of all you can rent up to 4 bikes at the same time to have a trip with your friends. Just download the app and enjoy biking. 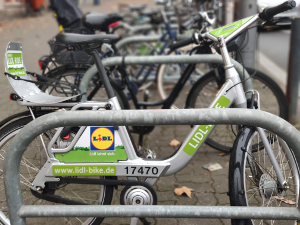 Another great bike sharing company is LIDL Bike, which used to be called Call a Bike when it was operated by Deutsche Bahn. Keep in mind that LIDL Bike is charging a hefty 10€ fee if you leave your bike outside the S-Bahn Ring. Also if you leave your bike close to one of the 350 drop off zones which are mostly close to S-Bahn and U-Bahn stations you will automatically get a 50cent discount. Similar to Deezer Nextbike the LIDL bikes are good quality bikes with air-filled tyres and are usually in perfect shape and condition. You are able to rent up to 2 bikes at the same time with the same account. Just download the app and start cycling. If you have been in Berlin more than 1h than you most likely have seen already one of the countless Mobikes in town. 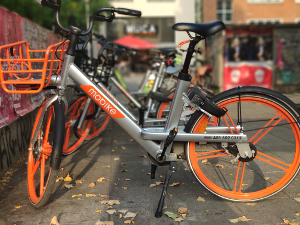 Without knowing the exact numbers of Mobikes in Berlin it sure feels like there must be more of those orange bikes than inhabitants in Berlin. 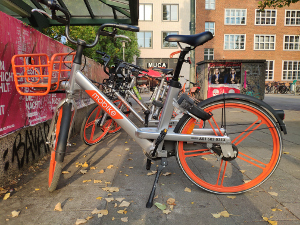 However Mobike is a good and cheap option for a bike sharing company in town. Rides come to a very reasonable price of just 1€ per 20 mins and you can drop of the bike anywhere you like within the S-Bahn Ring. Another cool company coming from the US is Lime Bikes. Basically they work the same way as all the other bike sharing companies. Download the app, find a bike, ride from A to B, drop off your bike and pay with the app. However one cool thing is that they also do have some E-Bikes for rental. Yes, Berlin is not San Francisco with steep hills, but trust me if you are on the way to work and you don’t want to smell like you just came out of the gym those E-Bikes are the real deal. 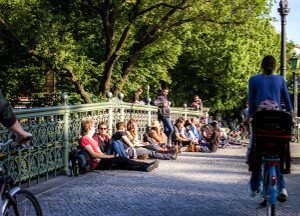 If you do not feel like biking and prefer to drive in a car from A to B then check out our guide to the best carsharing companies in Berlin. Gute Fahrt!